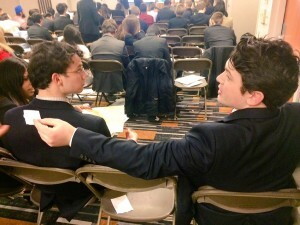 Draft Resolution 1.1 was leaked from the Special Summit on Technology committee within the General Assembly at the sixty-first session of the Harvard National Model United Nations conference. The draft resolution highlights the many difficulties multilateral negotiations face on the topic of health and technology. The UK is leading the discussion on Resolution 1.1, which is being co-sponsored by France, Azerbaijan, and South Africa. Signatory countries include powerful global actors such as the United States of America or Germany, as well as more disadvantaged and poverty-affected countries such as Ukraine, the Republic of Congo, or the Central African Republic. The resolution focuses on access to education and information, funding, and fostering innovation. The most highlighted clause under “funding” calls on developed nations to assist developing ones in building an adequate economic infrastructure in order to support large-scale capital injections both from private entities and foreign governments. This means that developing countries are asked to develop an infrastructure that includes up to date banking systems, investment securitization, and leveraging protocols. “Instead of having one international body dictating what’s appropriate health policy, we’ve taken a regional approach because no one is going to better understand African health concerns than the sub-region of Africa,” the UK delegate told The Guardian. The working paper hopes to achieve a better global infrastructure for health technology by creating subsidiaries of the World Health Organization as well as separate, specialized groups that will give nuanced recommendations to each subregion. “Unlike other resolutions on the floor, we make it attractive for foreign companies to invest into health technology in developing nations, and that’s something we’re yet to see with others,” the UK added.